In this series, I am creating a fictitious module called Generic Application Solution (GAS). The assumption will be that the reader has an intermediate knowledge of development in Dynamics 365 as well as best practices. This post will build upon the last post by adding the number sequences tab to the parameters form. 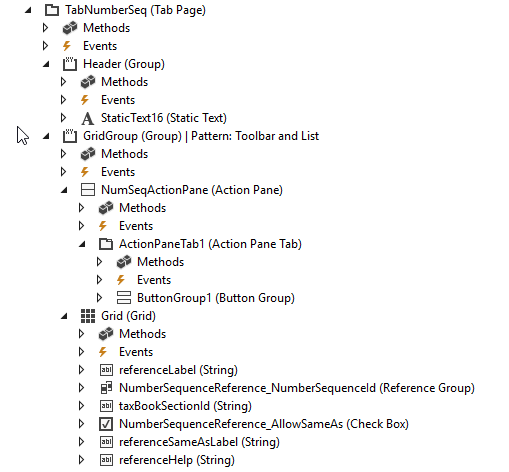 It is best practice to add a number sequence tab to the parameters form for the number sequence module. This user interface element allows users to more easily set the number sequences for the module without needing to sort through all of the number sequences in the application. The parameters form needs to have a data source for the NumberSequenceReference table. For this exercise, the data source will be named NumberSequenceReference. This data source will need to have NumberSequenceTable as a referenced data source. Additionally, developers will need to add the following methods to this new data source. /// Validates the <c>NumberSequenceReference</c> buffer. In addition to the above methods, developers will need to override the resolveReference and the lookupReference methods on the NumberSequenceId field on the data source. 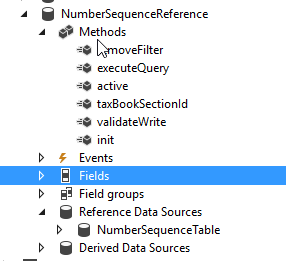 // Create a custom Query that filters on NumberSequenceScope. // Return the record selected by the user. The following member variables should be added to the form. The init method of the form is where the objects supporting the number sequence tab should be initialized. Add the following code to this method. Some parts of this code will not compile until after the user interface elements have been added. The user interface elements consist of a tab on the form. Under this tab, the user will find a grid that will list all of the number sequences for the module. To keep things simple, it is best to copy these user interface elements from other parameters form such as CustParameters and adjust it as appropriate for the module. For this exercise, I copied the TabNumberSeq tab from the CustParameters form. In order for the number sequences to show in the grid, there will need to be a call to the load method of the NumberSeqModule class (which calls the loadModule method). There are multiple options to accomplish this action such as employing a runnable class that the system administrator executes after deploying the module. In this exercise, I added a button that performs this action. // and to click okay to continue. That concludes the steps needed to add the user interface elements of a number sequence module. However, at this point, there will not be any entries in the number sequence grid. For that, developers will need to create data types that use a number sequence and to add it to the number sequence module class. This will be the topic of the next post.